Session VI – What do we mean by “Our Land”? There is a conflict – and there are casualties – because one member of the family has not tidied up after himself. Bart believes that he should be allowed to leave his belongings all over the house – not just all over his room – and that it should be his father’s responsibility to avoid stepping on them. Marge believes that Bart should tidy up his room – she seems to view the stuff in the hall as “overflow”. Homer just lies there. But is the conflict really about tidiness? Bart clearly sees no problem with his stuff spread all over the floor. 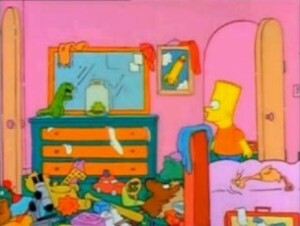 Homer probably has no opinion about tidiness, he just wants Bart’s stuff no where near his feet. And Marge wants Bart’s stuff to be arranged in an orderly or aesthetic fashion in his bedroom. In essence, there is a battle going on about who has the right to put what stuff where. How does this play out in your house? How does it feel to have to limit your self-expression to your bedroom? Do you look forward to the day you might have your own apartment? Let’s extend this idea of “recognizing yourself in your home environment”. Writer and broadcaster Gadi Taub refers to this connection between your personal identity, and your physical surroundings, in the context of Israel. He refers to the words of a Holocaust survivor, who talked of her relief at reaching a land in which her identity was writ-large, in the public sphere. Taub seems to believe that in order for your land to feel like your land, it needs to display something of your culture and your value system in the public sphere. Is that a fair summary of what you understood from Taub? Where would you say the public sphere in the States displays something of your culture or values? 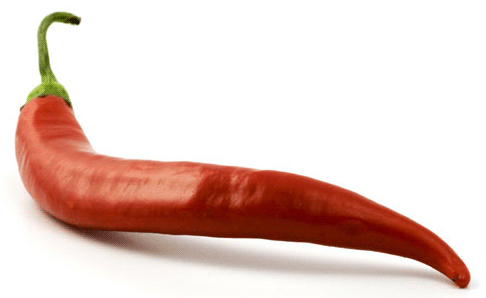 Where would you say the public sphere in Israel displays something of your culture or values? Another way of assessing your connection to a land, is by connecting to the physicality of it – the land itself. Woodie Guthrie stated this claim so resonantly with his classic “This Land is My Land”. Is your relationship to your land through your feet and your eyes? Let’s take a look at a short video about a famous cartoonist in Israel: Shay Charka. Charka is known for his skill as an illustrator, his eye for the subtleties in Israeli life, and for his firm identity as an orthodox Jew living in Judea and Samaria/The West Bank. If you were to draw yourself, would you draw lines underneath your feet? What do you think about Charka’s representations of the Jew living outside of Israel? Can you empathize with the Israeli who sees the land as an inextricable part of who s/he is? The most important lines in Woody Guthrie’s famous song are rarely heard. As a result it is rare that the song is recognized for what it was intended to be: A protest song. Guthrie was writing at the time of the Great Depression, pointing out that feeling connected is not only to do with the land, but also to do with a feeling of belonging, of shared values. Does Guthrie express acceptance, defeat, resentment, or defiance? How would you compare Guthrie’s classic to this song by Ehud Manor sung by Ninet Tayeb? Does Manor express acceptance, defeat, resentment, defiance, or something else? 24 Do not defile yourselves in any of those ways, for it is by such that the nations that I am casting out before you defiled themselves. 25 Thus the land became defiled; and I called it to account for its iniquity, and the land spewed out its inhabitants. 26 But you must keep My laws and My rules, and you must not do any of those abhorrent things, neither the citizen nor the stranger who resides among you; 27 for all those abhorrent things were done by the people who were in the land before you, and the land became defiled. 28 So let not the land spew you out for defiling it, as it spewed out the nation that came before you. 29 All who do any of those abhorrent things — such persons shall be cut off from their people. 30 You shall keep My charge not to engage in any of the abhorrent practices that were carried on before you, and you shall not defile yourselves through them: I the Lord am your God. כד אַל-תִּטַּמְּאוּ, בְּכָל-אֵלֶּה: כִּי בְכָל-אֵלֶּה נִטְמְאוּ הַגּוֹיִם, אֲשֶׁר-אֲנִי מְשַׁלֵּחַ מִפְּנֵיכֶם. כה וַתִּטְמָא הָאָרֶץ, וָאֶפְקֹד עֲו‍ֹנָהּ עָלֶיהָ; וַתָּקִא הָאָרֶץ, אֶת-יֹשְׁבֶיהָ. כו וּשְׁמַרְתֶּם אַתֶּם, אֶת-חֻקֹּתַי וְאֶת-מִשְׁפָּטַי, וְלֹא תַעֲשׂוּ, מִכֹּל הַתּוֹעֵבֹת הָאֵלֶּה: הָאֶזְרָח, וְהַגֵּר הַגָּר בְּתוֹכְכֶם. כז כִּי אֶת-כָּל-הַתּוֹעֵבֹת הָאֵל, עָשׂוּ אַנְשֵׁי-הָאָרֶץ אֲשֶׁר לִפְנֵיכֶם; וַתִּטְמָא, הָאָרֶץ. כח וְלֹא-תָקִיא הָאָרֶץ אֶתְכֶם, בְּטַמַּאֲכֶם אֹתָהּ, כַּאֲשֶׁר קָאָה אֶת-הַגּוֹי, אֲשֶׁר לִפְנֵיכֶם. כט כִּי כָּל-אֲשֶׁר יַעֲשֶׂה, מִכֹּל הַתּוֹעֵבֹת הָאֵלֶּה–וְנִכְרְתוּ הַנְּפָשׁוֹת הָעֹשֹׂת, מִקֶּרֶב עַמָּם. ל וּשְׁמַרְתֶּם אֶת-מִשְׁמַרְתִּי, לְבִלְתִּי עֲשׂוֹת מֵחֻקּוֹת הַתּוֹעֵבֹת אֲשֶׁר נַעֲשׂוּ לִפְנֵיכֶם, וְלֹא תִטַּמְּאוּ, בָּהֶם: אֲנִי, יְהוָה אֱלֹהֵיכֶם. What would you say is more important according to the text – the purity of the land, or the well-being of those living on the land? Looking carefully at this text, can we understand that the land is unconditionally ‘ours’? This text would seem to suggest that the land of Israel needs to be tended to, by proper conduct. 3. What about the Palestinians? There are huge areas of the United States that were once Mexico. Many would argue that the entirety of Woody Guthrie’s land was once the land of Native Americans. There are many countries around the world where more than one people call the same place “Our Land”. Israel is no exception. While most Jews will say that Israel is “our land”, so most Palestinians will claim that the same territory is their land. For an introduction to the issues involved, we recommend wandering around this interactive site.